Monoglass® combines soft glass fibers and polymer adhesive to create a non-combustible, non-toxic, insulation that can be quickly spray applied to virtually any surface or configuration. With an R-value of 4.00/inch, installations of R-20 overhead, or R-28 on vertical surfaces can be applied quickly and easily in one pass without costly, slow layering or mechanical support. Monoglass is applied by trained applicators using approved equipment, ensuring quality control and consistency. Quick, one pass application with no layering required. 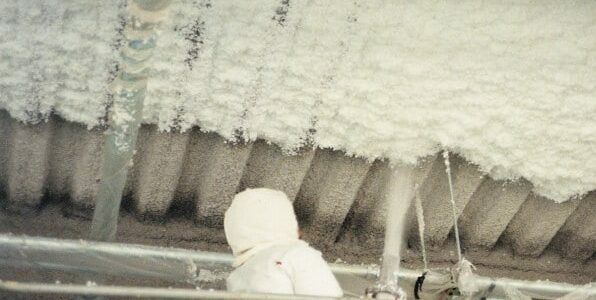 Monoglass Spray-On Insulation has been tested to the following test standard. *Wind Tunnel test data to a modified, non-standard application of Monoglass. Contact Monoglass Inc. for complete information. 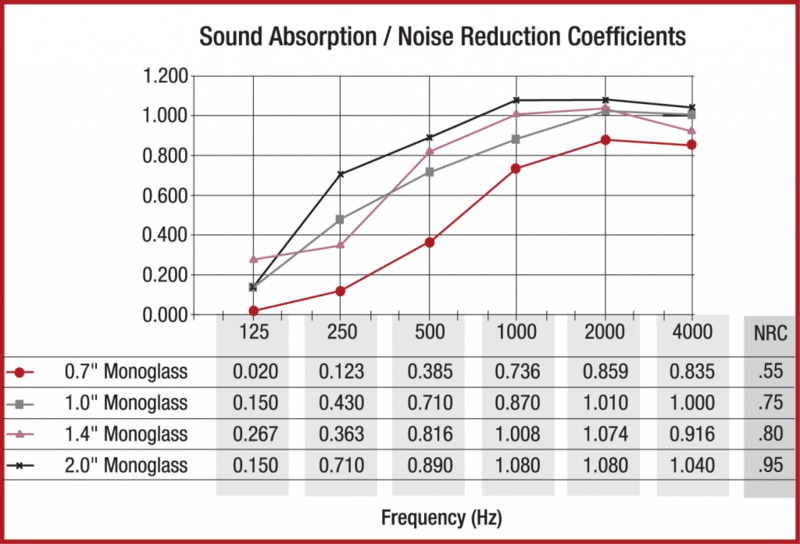 Monoglass Spray-On’s low compressive strength glass fiber produces noise reduction coefficients greater than many other insulations. This capability reduces airborne noise transmitted through the structure from external sources and provides superb absorption of internal airborne sound. 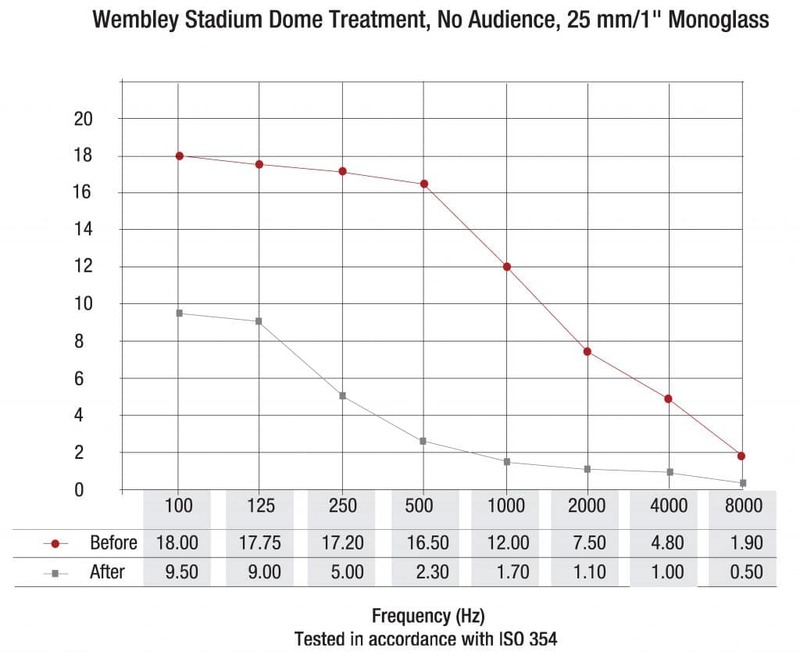 Noise reverberation time can be greatly reduced with a minimal application of Monoglass, as demonstrated in the Wembley Indoor Sport Stadium, Johannesburg, South Africa. 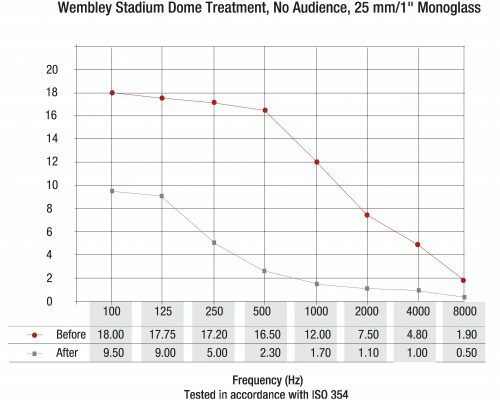 Treated with only 1” / 25 mm of Monoglass, the graph (below) depicts the reverberation times with 0% occupancy measured before and after treatment. This shows a considerable reduction in reverberation time over the entire frequency range, which resulted in major improvements in speech intelligibility. Before treatment, speech conversations more than 61⁄2 feet / 2 meters was very difficult. After treatment, even with the hall empty (no audience), conversation can now be conducted without any special effort. Click here to view the full before & after test report. Monoglass Spray-On is approved for use over fireproofing materials because it is non-combustible and will not affect the fire ratings of the fireproofing materials it is applied to. Because it is sprayed right over the fireproofing, it helps solve normally difficult design problems such as how to insulate the underside of corrugated steel decking. 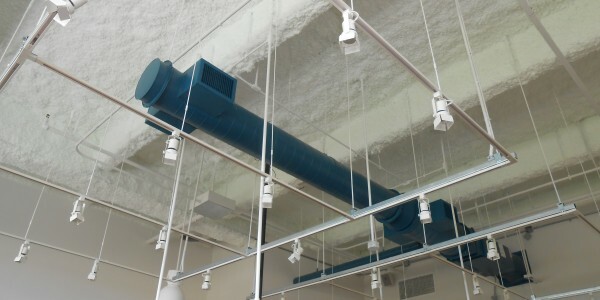 Structural fireproofing and Monoglass thermal/acoustic insulation combine to achieve required fire ratings, thermal values and acoustic properties on steel or concrete structures. Structural steel and concrete beams are sprayed with cementitious fireproofing material, to provide fire-resistance ratings. 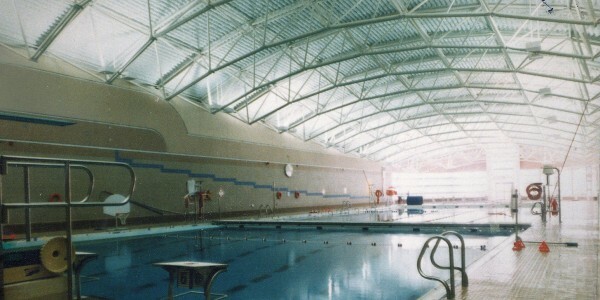 Monoglass is applied over fireproofing to achieve thermal and acoustic requirements, bonding easily and permanently to the fireproofing material beneath. Determine fireproofing hourly rating from technical manuals to meet building codes and to establish fireproofing thickness required. 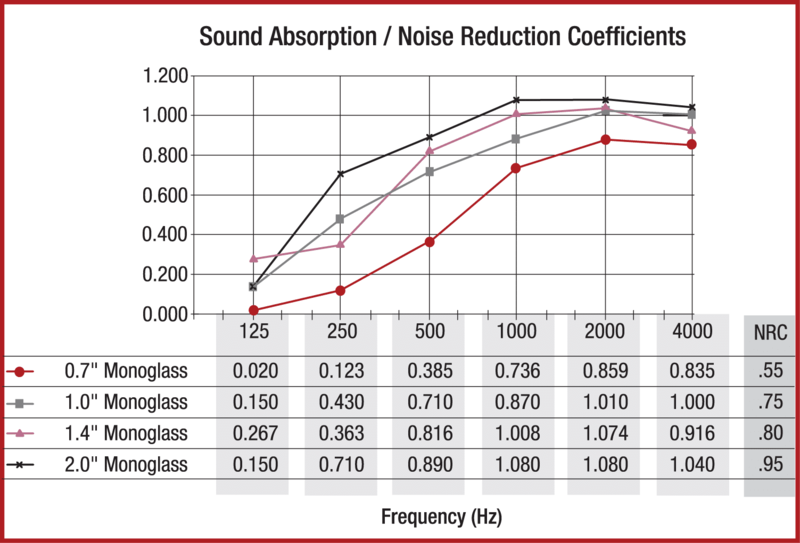 Use the following table to establish Monoglass thickness for required thermal insulation value or noise reduction coefficient. Please note: The above table includes thermal value for Fireproofing and Monoglass® combined, where Fireproofing is assumed to have a K-Value of 0.611. The K-Value of Monoglass® is 0.25. Monoglass® does not support mold growth. 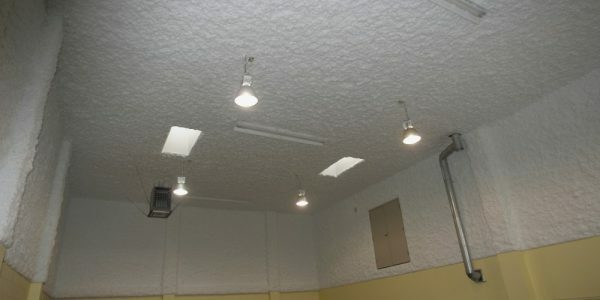 Unfortunately, mold has become a substantial problem in almost all areas of building construction. When a product is being chosen, the specification writer must have confidence that the product utilized will not support mold growth at any time during the life of the building. The health of the people using a building as well as liability considerations must be taken into account for the projected life span of any new project. Monoglass helps eliminate mold concerns. In order for mold to grow, there needs to be a food source. Organic, paper based products provide an abundant source of food. The only way for these products to reduce the risk of mold is through the addition of chemicals, which over time may lose their effectiveness. 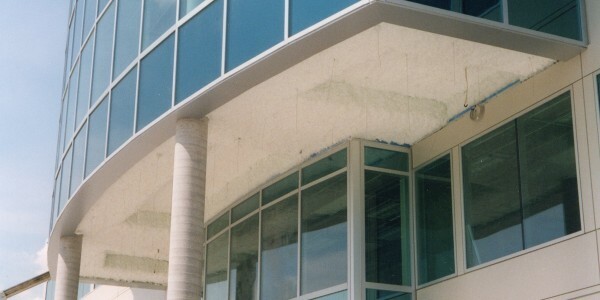 As a fiberglass based product, Monoglass is inorganic and therefore incapable of supporting mold growth. Simply put, the mold has no food source. There is no need for the addition of any chemical products to retard mold growth. Therefore, there is never a need to reapply any chemicals in order to maintain mold resistance. ASTM G-21 and MIL STD 810F. 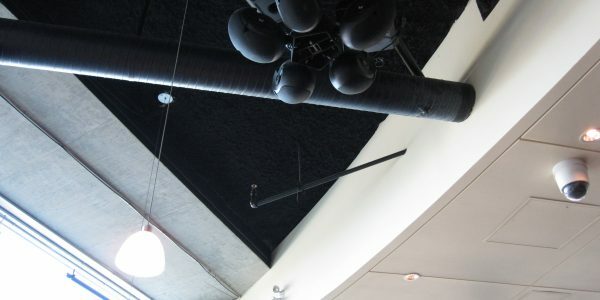 Noise control to offices above with Monoglass Spray-On applied to ceilings at Century City Brew Pub. Sound control in the environment has become absolutely necessary in a complex society, be it where we work, live or play. Cotton-like Monoglass® Spray-On is non-combustible and exceeds older, inefficient, non-permanent systems without increasing construction costs. In addition to having high STC and NRC ratings, Monoglass is pneumatically applied, which helps seal cracks and holes in drywall, fills voids normally left by batt insulations, and seals around plumbing and electrical outlets to prevent sound ‘leaks’. Minimum STC ratings are required under most building codes for partition walls, corridor walls and floor/ceiling assemblies. The higher the STC number, the greater the sound transmission resistance. A descriptive table outlining the various increments of STC class is shown below. A 37mm / 1.46 inch application of Monoglass has been shown to increase the STC value of an assembly by 5, when tested to ASTM E-90-85. This will make a clearly noticeable difference when compared to an uninsulated wall or ceiling. 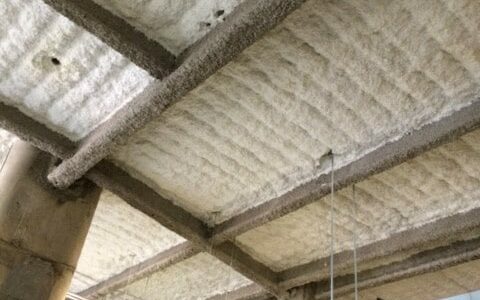 The STC ratings of Monoglass insulation are similar to those of fiberglass batt insulations, however, because Monoglass is sprayed in place it will fill voids that batt insulation may not. Also, Monoglass adhesives keep the insulation in place so that it will never settle over time leaving gaps. Monoglass Spray-On helps reduce sound transmitted to neighboring businesses, at DogSmart Training Facility.